The idea for Issue 9’s special feature, punctuation, was born from a fondness for little things that tend to be overlooked in the big, busy events of each day. At least that’s how I used to think of punctuation—as the smaller, less important cousin to the glitzy world of words. It started with questions like: Why don’t we think about the origins of punctuation as much as we think about how words came to be? How did we arrive at the conclusion that a period refers to a pause longer than the one a comma signifies? Does anyone even care about punctuation anymore? In this issue, Ashley Timm runs us through a brief History of Punctuation in English and the stories behind a few of these punctuation marks. 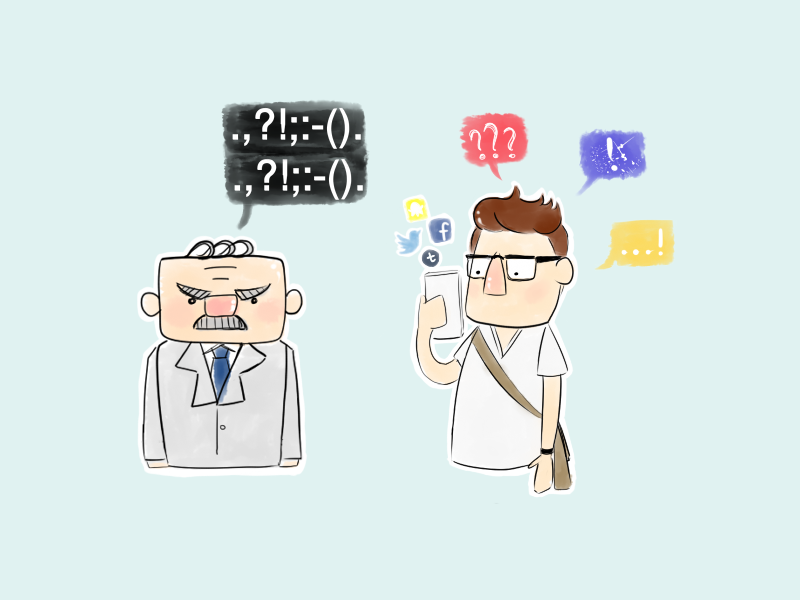 Min Lim, on the other hand, looks to the digital age and the origins of Japanese kaomoji that help its users express nuanced emotions in the way words cannot. ヽ(・∀・)ﾉ On the subject of punctuation in the digital age, it’s clear that people still care deeply about punctuation. They really do. In Punctuation in the Digital Age, Clara Miller-Broomfield points out that prescriptivists and descriptivists are still divided on how punctuation should be used even as the meanings encoded in punctuation marks continue to change. In another piece on Punctuation in the Age of the Internet, Kevin Kabeya further offers his opinion on why people don’t follow prescribed rules for punctuation while communicating digitally. Don’t know the difference between hyphens, en dashes, and em dashes? Unravel’s resident pedant Anirudh Krishnan offers this useful guide. It’s incredible to note how tiny punctuation marks in English have raised so much debate. In many ways, more attention is paid to punctuation than many indigenous languages with small speaker populations will ever be given. A brief search for “Unangam Tunuu” on Google, for example, delivers 12,000 results as opposed to 26,600,000 results for the search terms “punctuation English”. With their respective language profiles on Unangam Tunuu and Rapa Nui, both Kevin Wong and Fuad Johari move the attention back to these languages and their communities that have struggled through centuries of suppression and dislocation, and which are undergoing a gradual process of revival today. The fascinating histories and features of these languages offer a glimpse into the complex negotiations between identity, language, and geography. Finally, Frances Loke Wei interviews Miguel Escobar Varela for our Interrogatives column on his love for Contemporary Javanese Wayang Kulit performances, the web archive of performances he built and got translated into English and Bahasa Indonesia, and its negotiation of identity through language. Our heartfelt thanks goes to our very talented designers Min Lim, Sheryl Ann Tan, Frances Loke Wei, and Daryl Han for their beautiful header images and our Issue 9 cover image! said the artist Andy Warhol. Here’s to you our readers who have kept us at Unravel going with your interest in all things language-related for two years now. May you, in this issue and towards the end of 2016, find little things that thrill! Feliz Navidad y bueno año nuevo!